The Pit Slide is a room inside the Old Clockworks in Luigi's Mansion: Dark Moon. The Pit Slide is accessed by taking the north door inside of the Roundhouse Pit. This room, as the name implies, is basically a long slide. On the slide, there are mounds of sand with Gold Bars in them. Luigi can simply slide over these mounds to get the gold. Some spiders are seen crawling on the walls on the way down. At the bottom, there are two red vases, two blue vases, and a door to the Quarry. It is not possible to go back up the slide. 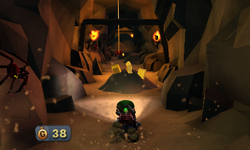 During C-2: Underground Expedition, Luigi needs to go down the Pit Slide in order to reach the Quarry. Before Luigi slide down, the room shakes momentarily. If Luigi goes back into the Roundhouse Pit after the room shakes, there are several Gold Bars on the floor as well as gold spiders. At the bottom of the Pit Slide, Luigi can shine his Dark-Light Device on the area with the missing red vase. After sucking up the Spirit Balls, inspecting the vase yields a lot of coins, bills, and Gold Bars. The Pit Slide has a very similar layout to the Secret Mine's Skip Slope, which both are a long slide down and both lead from Basement 1 to Basement 2. In Outlandish Interruption, there is a spring pad at the bottom to launch Luigi back up. This page was last edited on March 1, 2019, at 19:12.